Respect all foreign buildings. Buildings not being protected does not mean they are free to loot or to destroy. These actions are logged and nearly every kind of griefplay will lead to a server ban. No Hacks/Cheats/Exploits that are able to alter the gamebalance or give you an unfair advantage against other players (Speedhack, Flyhack, X-Ray Mods, Item-Hacking, Item-Dupes ...). Get caught: get ban. Watch your language and be polite in chat. Avoid capslock. Spam or inappropriate language leads to a mute in the global channel, in severe cases to a ban. Racism will get you banned instantly. Don't spoil the landscape. 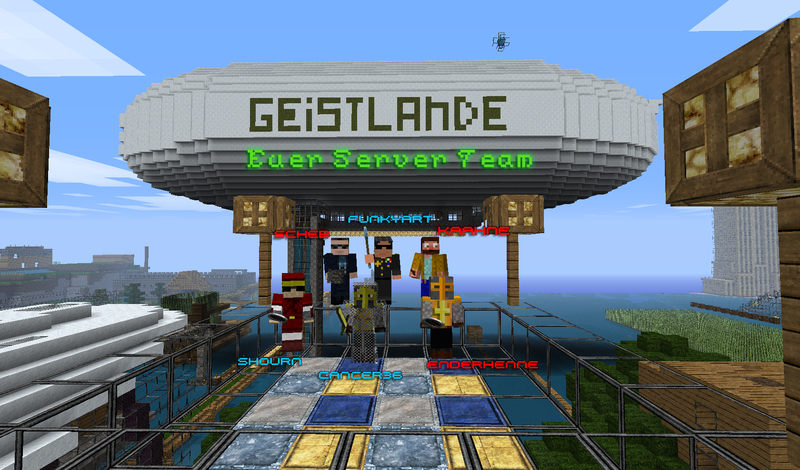 No 1x1-Towers, no floating trees und no senseless lava oder water that may cause lag. Funtional Buildungs also known as "Farms" may not be protected at all and can be removed if necessary. No Server-Advertising or Server-Support in the Chat. Posting inappropriate or suspicious links will get you banned. You're responsible for the security of your account. We don't care if it was you or your little brother who violated the rules. In every situation "common sense" should be your best guide what to do and what not to do in our world. You may try to read the other parts of our homepage with the Google translation tool, though some results may sound funny. If you're completely ok with our rules and the gameplay setup of this server you can apply for building rights by telling a member of the serverteam (look at the box on the right side) the code "Konfuzius" via /msg.